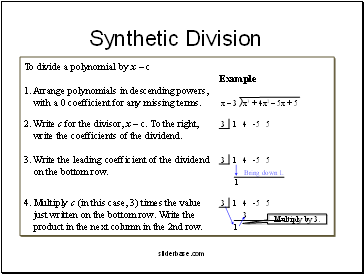 Arrange the terms of both the dividend and the divisor in descending powers of any variable. 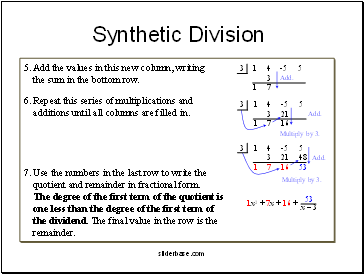 Divide the first term in the dividend by the first term in the divisor. The result is the first term of the quotient. 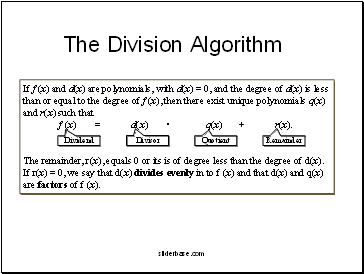 Multiply every term in the divisor by the first term in the quotient. Write the resulting product beneath the dividend with like terms lined up. Subtract the product from the dividend. 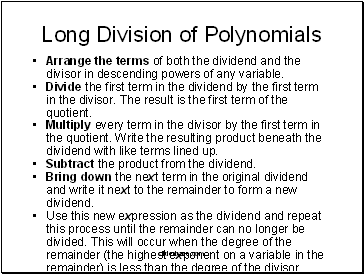 Bring down the next term in the original dividend and write it next to the remainder to form a new dividend. Use this new expression as the dividend and repeat this process until the remainder can no longer be divided. This will occur when the degree of the remainder (the highest exponent on a variable in the remainder) is less than the degree of the divisor. Divide 4 – 5x – x2 + 6x3 by 3x – 2.
f (x) = d(x) • q(x) + r(x). The remainder, r(x), equals 0 or its is of degree less than the degree of d(x). 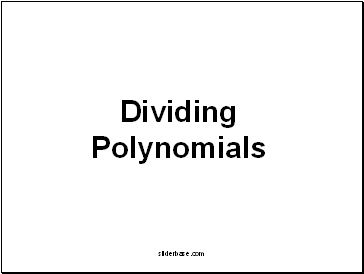 If r(x) = 0, we say that d(x) divides evenly in to f (x) and that d(x) and q(x) are factors of f (x). 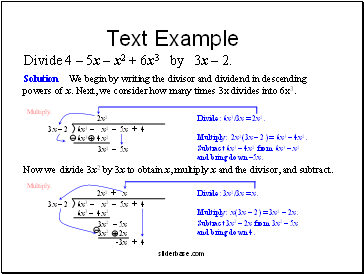 write the coefficients of the dividend. on the bottom row. Bring down 1.
the sum in the bottom row. additions until all columns are filled in. 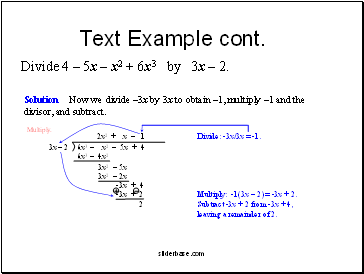 quotient and remainder in fractional form.